The High School grade band addresses grades 9-12. The instructional lessons for each unit at the High School level contain a consistent format for identified reading, writing, and math activities. Unique Learning System's monthly lessons are presented as thematic units that follow a schedule of topics. Each unit is based on a social studies or science topic and incorporates reading, math, writing, science and social studies activities into the lessons. Each unit comes online one month prior to implementation and stays online for two consecutive months. Two monthly units are available online at a time for access. Lesson content is automatically added into subject blocks in Teacher Dashboard according to the schedule set by the teacher. Choose the subjects that you teach during the My Plan setup wizard to populate lesson materials from the Suggested Monthly Plan. For more information on the Teacher Dashboard, click here. Each Unique Learning System® unit is designed to address a social studies or science topic. These topics are embedded in the materials as a thematic unit. The Standards Connection page at the beginning of the lesson plans will identify the social studies or science Instructional Targets for the entire unit. This introduction will address the scope of the unit in relation to these content standards. This may include ways and ideas that can be incorporated in lessons to assure that students are being instructed on content as well as the reading, writing and mathematics skills. Additionally, a library of Science and Social Studies materials are available in the Science and Social Studies Courses library so that teachers may pace instruction within their classroom schedule. For more information on Science and Social Studies Courses, click here. Each monthly unit contains a consistent format of lessons and activities. The lesson number and activity title stay the same each month, while the content changes appropriately to the unit topic. To view a list of the topics for the year, select Year Topics from the Unique Learning System menu. Lesson plans are provided for each activity in the monthly unit. 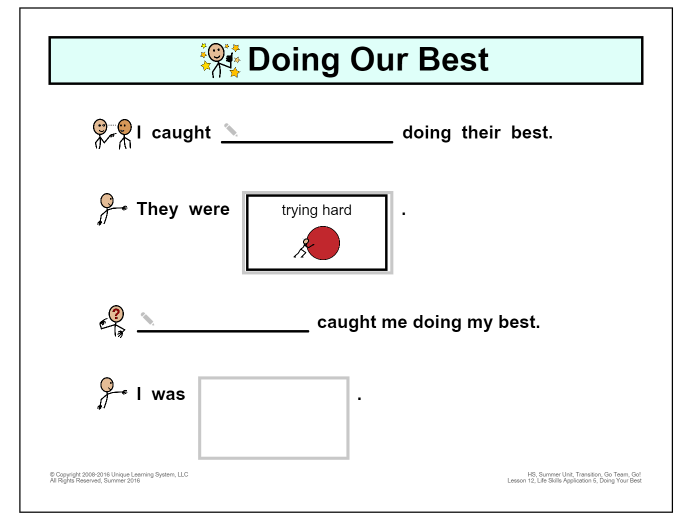 Instructional Targets: The first section of the lesson plan lists the instructional targets. A space is provided where you may put the direct link to your state's standards that apply to this lesson. The alignment tools in the member menu contain standard alignment documents and resources to connect state and educational standards with the Unique Learning System instructional targets. Activity: The activity section of the lesson plan will describe the activities and how you can deliver this lesson to students. Additional learning information will be added here to support your presentation of the topic. Standards Connection: Standards connections are included in many of the lesson plans to add a more rigorous alignment of the materials to the state and educational standards in ELA and Math. Standards Connections are only added to selected lessons. Differentiated Tasks: The next section of the lesson plan is the most important - the suggested differentiated tasks. The learning needs of students in your classroom may be very broad. The basic premise is that ALL students will participate in the same or similar activity, but the expectations for learning may be quite varied. These differentiated tasks provide teacher guidance on what the learning expectations might be for three levels of students. Resources & Materials: Finally, at the bottom of each lesson plan is a list of materials that can be downloaded to deliver this lesson. Many of the lessons also have three levels of materials that coincide with the differentiated tasks. Additional materials and resources are also listed; these may include books and websites that support the instructional learning. Standards Connections are included in many of the lesson plans to add a more rigorous alignment of the materials to state and educational standards in ELA and Math. Standards Connections are only added to selected lessons. A Standards Connection gives direction on how to extend the lesson with its included materials. The instructional lessons for each unit at the High School level contain a consistent format for identified reading, writing and math activities. It is essential that teachers assess their students’ current abilities and plan instructional tasks that differentiate for maximum participation and learning within each of these lessons. These tips are designed to provide instructional ideas that will enable teachers to meet the needs of each student in the classroom, regardless of ability level. Strategies with this icon bullet represent suggestions that are appropriate for the students with significant cognitive disabilities, focusing on their complex functional and life skill needs. Eliciting a consistent and readable response may be the primary goal or participation. Access the Instructional Tips document in the Teacher Reference Materials > Instructional Guides. A leveled book is provided at the High School level. Unique Learning System has designated books according to levels. The first lesson includes three levels of books on the same topic. Leveled books will contain a predictable format. In these books, direct picture support is provided to build content meaning. Students who have very limited reading abilities will be able to engage in these books. There may be some students who should be engaging in direct reading instruction at the high school level. Teachers may want to extend the learning from the leveled book into word recognition and word decoding skills as applicable. The guidelines for these levels are outlined in the Leveled Books document which can be found in the Teacher Reference Materials > Instructional Guides > Leveled Books. Benchmark tools are also available in the GPS to assist teachers in selecting the appropriate reading level for students. Additional leveled books from various authors and publishers are listed in the Supplemental Reading Lists document in the Monthly Tools section of the Monthly Lessons. 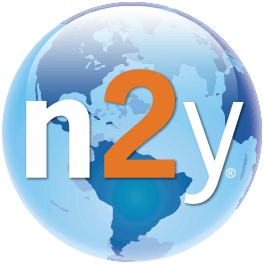 The online collection, n2y Library, contains a variety of leveled books which address numerous student interests and topics as additional reading materials. 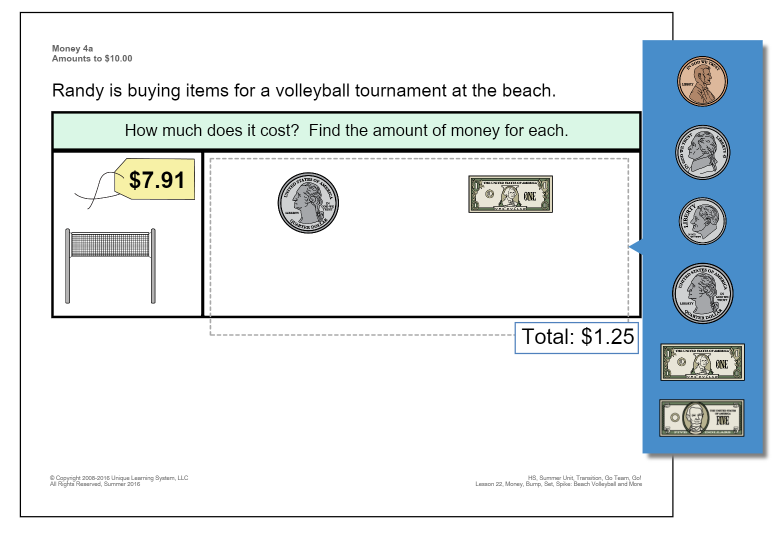 Simple chapter books are reduced-language leveled books based on the topic of the unit. Each chapter is provided in text format and symbolized-reduced-language format. Some students may be able to read this independently. The text may also be read aloud to students. At the bottom of each page of the higher level format is a short question that can be used to reflect on what was read and begin further discussion. Picture support is provided in the chapters. Discuss what is seen in the picture and how this relates to what is read. The communication board with each chapter may be used to encourage responses. Written comprehension formats are at the end of the chapter. Questions are presented in fill-in-the-blank and multiple-choice formats. The format used will depend on the student abilities. Additionally, an advanced level of questions is provided, which is appropriate for students who need higher level thinking processes in locating information within the text. Comprehension questions are intended to build meaning from the materials that have been read and to encourage retelling skills. Extended opportunities to bring the students into a discussion, identifying the main ideas that have been read and recognizing details that are important to their lives will benefit comprehension. Writing activities vary but are always provided with a template for those students who need it. Writing may be considered a process that involves not just the typical handwriting process, but also the planning and communication. Using template formats allows students who do not have the ability to “write” express an idea that can be incorporated into a story, a paragraph, a poem or other document that can be conveyed to share information. Students may use SymbolStix as well as printed words to complete these documents. Consider ways that writing activities can be read, shared and extended beyond a “one-time” activity. Document editing gives students the opportunity to learn the conventions of capitalization, punctuation and spelling. Talk through the process of editing as a learning strategy. Four written documents are presented in each lesson. The documents contain errors that students are to locate and change related to capitalization, punctuation and spelling. Students utilize resources to make decisions concerning which information to include in a real-world scenario (e.g. what address on an invitation or which phone number to include on an application). Lesson 18 is divided into steps and results in a newsletter that provides a means to report what has been learned in the monthly unit. Using the appropriate template support, students will “write” a paragraph describing a chosen activity. Students may generate their work using writing, pictures, dictation or other appropriate communication modes. Each month, there are four writing prompts. The first writing prompt will be a class journal writing. The other prompts will either be supported or independent writing. Journal entries can be dated and kept in a binder to follow growth. 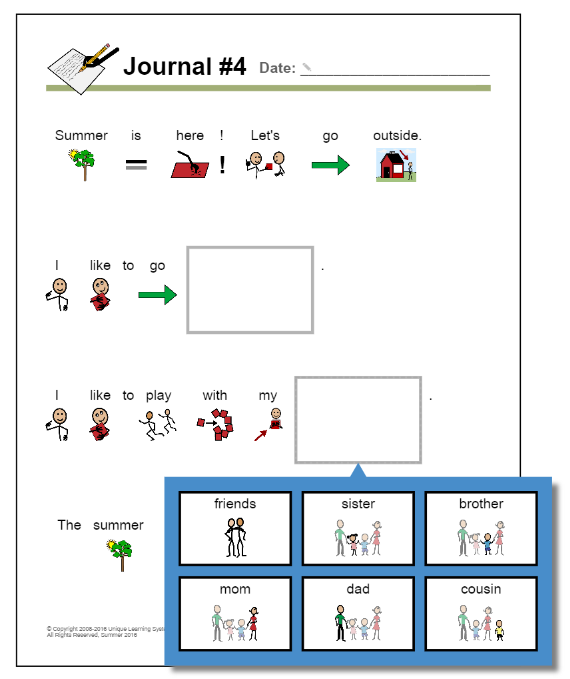 Students can fill in the template with words or pictures (utilizing SymbolStix), or they may write independently. Journal entries may be shared orally. Math tasks may be interspersed in a variety of classroom activities. It is important to recognize opportunities for counting, adding and subtracting within the context of real-world situations. The math activities in each unit are built on these real-world scenarios. Random counting or number identification does not lend to daily application, as do activities that appear to serve a purpose. Sample scenarios are provided within the unit, however, teachers should create similar scenarios to provide daily practice in math skills. Math activities will always include starter ideas for counting, calculation, money, time, data analysis and measurement. Teachers must consider the ability level of the individual students and how to accommodate the lesson to meet the individual needs. Activities may be repeated or revised to provide additional math learning opportunities. Dynamic Math - Unlimited Math Problems! Recipes and crafts are frequently provided within unit activities. These provide a real-world application of skills. Students can engage in skills for direction following and use of measurement tools. These skills also have lifetime applications for students who may be able to maintain a level of independent living or increased participation in their daily living routines. A list of items needed to complete the recipe or craft can be located in the Supply List which can be found in Monthly Tools > Supply Lists. Charting and graphing information can involve a variety of activities – asking and answering questions, counting and problem-solving analysis. This can often be incorporated into activities where students indicate their favorite or a preference. When the student responses are placed on a graph or chart, it can be analyzed to answer a group question. Money-related activities are built into units within the context of real-world scenarios. Individual abilities must be considered in all money-related activities. Some students may only be able to match coins for a given amount, while others may be able to make change. Across all grade band units, the teacher will be provided with scenario activities, but should adjust the goals for the individual student. Suggestions for coin/bill recognition, identifying money values, counting coins and bills are provided in the lesson plans to accommodate these learning differences. Calculating time in a schedule is an important life skill. How long will it take for a given activity? What time will it start? What time will you be done with this activity? This lesson can provide an opportunity to teach life skills as well as the math time concepts. Scenario cards that can be read aloud and used for problem-solving in real-world situations are provided. Simple geometry concepts to facilitate measurement and relationships of angles, points, lines, planes and solid figures are presented in this lesson. It uses practical scenarios that involve both measuring and the use of area to locate points on a map, plot locations and fit objects into model spaces. Simple math sentences are presented for addition and subtraction that build skills for problem-solving. Should we add or should we subtract? This is an early concept that builds across the grade bands. Students are presented with real-world scenarios that require higher level thinking skills to determine the mathematical equation that will help them solve the problem. The number journal is available within Unique Learning System's lessons. The interactive number journal activity is included in all Number Sense, Math Story and Algebra lessons, for grade Pre-K through High School. It is an interactive companion to the Mathematics Guide designed to help students achieve their differentiated task expectations virtually, assist in working out problems or create additional practice problems on specific math skills. The Mathematics Guide is located in the Teacher Reference Materials > Instructional Guides. To access the interactive math journal, launch the interactive document for the monthly lesson by clicking on the orange icon next to the lesson number. Click the Number Journal icon in the top-right to open the interactive activity. The number journal opens in a different tab, allowing your student to practice math skills simultaneously with a monthly math lesson. It should be apparent at the high school level that related content is providing a means for students to apply skills into a more solid life-skills focus. Field trip suggestions that may provide a means to explore vocational opportunities, as well as community resources that can be accessed, are included in each unit. 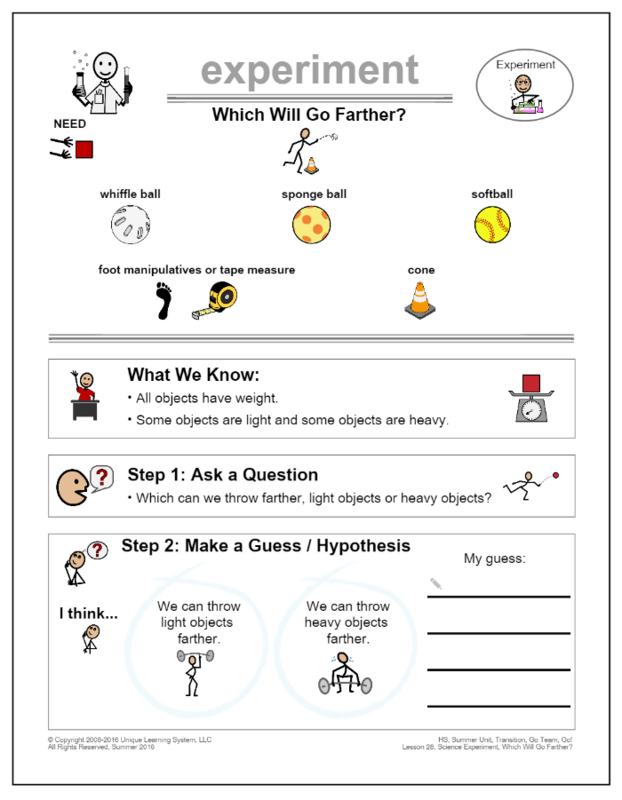 A simple science experiment that ties to the unit topic is included with each unit. These experiments are arranged with a “make a guess” hypothesis and allow for observation of results. To support the scientific process, utilize the document, “Scientific Inquiry Processes,” which can be found in the Teacher Reference Materials > Instructional Tools > Scientific Inquiry Processes. Timelines are simple sequencing of years or basic events. These serve as a historical sequence of events that relate to some aspect of the unit topic. Following each chapter is a life skills activity related to the content of the chapter. These will vary within each unit, but the intent is to extend learning in a meaningful task. Support materials are provided with these activities. The ability levels of the students should be considered when preparing support materials and setting goals for student participation. Students at the High School age are often beginning the transition planning process. Teachers may examine these life skills applications in relation to the “later-in-life” skills and supports that a student may require. 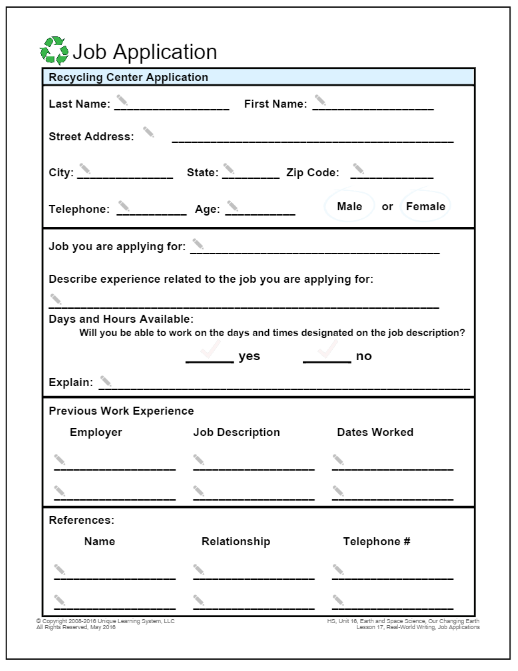 Life Skills Applications lessons (4, 6, 8, 10, 12). These skills are reflected in the Instructional Targets on the lesson plans, for example, Self-Advocacy, Social Skills, Work Skills, Problem Solving etc. Core Materials provide a foundation for the routine activities in the high school classroom, addressing transitional skills, including communication, employability, self-advocacy, social strategies and daily living. Refer to the lesson plans within the Core Materials section of the website. Transition Connections located in the Monthly Tools - this document shows the lessons with transition skills link. GPS - Core Rubrics: Assessment that addresses the transition readiness skill areas of employability, communication, self-advocacy, daily living, and social strategies. GPS - Transition Profile: Looks at transition-related skills for older students as they approach adult living and work. The skills addressed in the Transition Profile are employability, daily living, community, personal living and lifelong learning. GPS - Transition Planning: Provide information that will assist the student and his/her team in moving forward from the academic learning in early grades into the application of skills and personal preferences for transition years. The Transition Passport is a personal collection of supporting transition information that is essential for young adults to move into an effective system of transition planning. The Transition Passport includes four sections: Vocational, Daily Living, Personal Life and Community. Transition Planning is designed as a data collection center for Middle School, High School and Transition students.